Behind the Mic with Angela Hermann – Welcome to the 2019 Beemie Awards! 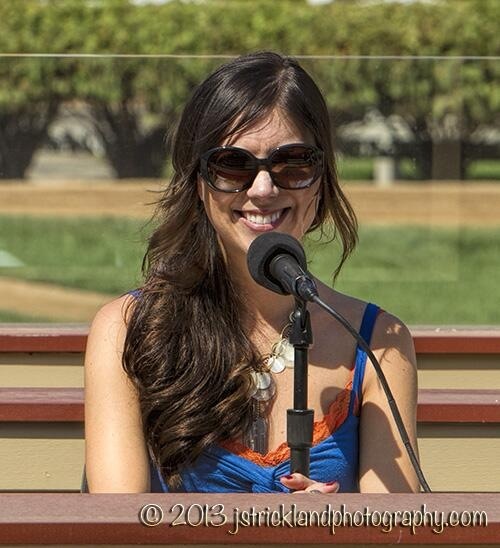 Our guest for Behind the Mic today is the television analyst for Canterbury Park in Suburban Minneapolis, Miss Angela Hermann! Angela has also been the track analyst for Hawthorne Race Course in Chicago and made many appearances on TVG while there. I have been a horse lover for as long as I can remember, but I first started watching horse racing regularly when I was 11. I had seen Canterbury races occasionally but the Kentucky Derby in 1998 was the hook for me. I picked my first winner, Real Quiet. From that point forward I recorded all nationally televised races, Canterbury replay shows, etc. and clipped the entries each day from the paper. It was an odd path to this destination, but I have no family connections to horse racing. My family have become fans through me but I started as a pure fanatic. I started in Hospitality an usher in the Clubhouse. My duties included seating guests, checking tickets and clearing dishes. I’m fairly confident I was the only usher with betting tips at the time. Pace handicapping works best for me. The classes are not as far apart at Canterbury as at larger tracks so I am usually seeking lone speed. Our grass also plays kindly to speed, so sometimes I’ll give a second look to a front runner if the price is right. On a bigger scale I like to play horses-for-courses regardless of class. Midnight Lute offspring tend to get handicapped through rose-colored glasses. You’ve worked at Hawthorne and Canterbury, what are your favorite races from each track? Hawthorne is easy, The Illinois Derby. The day was chaotic but the feel was unlike any other I’d been around. Departing is a horse I always quietly root for and he is all class. Canterbury is a little different, there are too many to choose from! I’d have to say it’s the 2008 Lady Canterbury. I had just wrapped up my first summer working at (now defunct) Lincoln Race Course and I was back to work for the Press Box at Canterbury. Claiming Crown day was big enough, then we added on the Lady Canterbury. There was a big handicapping contest in the Press Box with TVG folks, DRF writers, local press and a couple young kids that worked upstairs. I was the only one that had the 30-1 winner of the Lady C, #13 Quiet Queen. Another question with many possible answers….I passed out on camera during a different edition of the Lady Canterbury. The heat index was pretty high that day and I didn’t go inside much. The mic also got ripped out of my hand once at Columbus. The guy was tanked. Any time that a fan says they’ve had a good time because of a pick I gave them or a wager they found in the program I’ve done my job. My goal is to get people to love what I love about horse racing, and I feel like I have one of the best possible positions to do that. Of course we always hear about when we’re wrong but the worst thing I’ve heard was about me taking a horse that broke down. Not only did I get blamed for it breaking down but there were allusions to me joining the horse next time. Other than tracks you’ve worked at, what are your favorite tracks to follow and wager on? Southern California, that’s about it. I used to play more Delta but have moved away from it to focus on one or two tracks only. My attention span only accommodates for so much. A pick four at Hollywood Park in December of 2011. It was one of only a few times I’ve seen the pick five not pay out, and there were only two winning pick four tickets. A friend of mine and I split one. I plead the 5th on the amount. The Mystic Lake Derby….check. I’d be tickled to tackle the Arc……but I’d need a lot of time! It’s the last race at Canterbury and I’m getting hungry. Where are you gonna send me after the races for a great meal?